Britain’s Nuclear Experience: The Roles of Beliefs, Culture, and Identity. John Baylis and Kristan Stoddart. Oxford University Press. December 2014. Britain’s nuclear capability has been a focus of ethical, financial and political contention from its inception to today. Questions are being asked of whether a British nuclear arsenal is at all beneficial in post- Cold War globe and worth the multi-billion pound costs in the Age of Austerity. 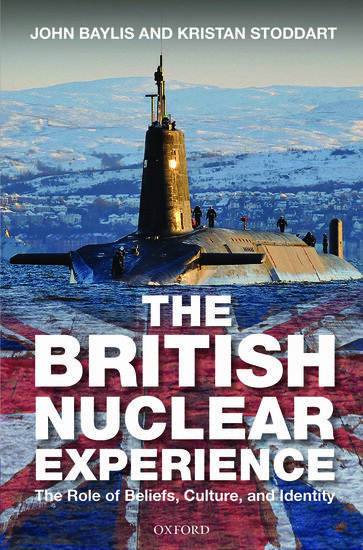 The British Nuclear Experience is a timely contribution to contemporary debate by John Bayliss and Kristan Stoddart – both are well-published academics whose research specialises in Britain’s nuclear arsenal and perennially morphing international role. The book is chronologically ordered: charting Clement Atlee’s deliberations over attainment of nuclear weapons up until David Cameron’s coalition government’s decision to postpone Trident, the country’s nuclear weapons programme, renewal or replacement plans until after the 2015 General Election. The book focuses on moving away from traditional conceptions of why Britain obtained and maintained nuclear weapons (such as the maximisation of power), emphasising rather Britain’s ‘pre-dominant, culture and self-identity’ as reasons to affirm the continuing maintenance of nuclear weapons. The authors are successful in lucidly recreating the predicament faced by British leaders in the aftermath of the destruction of Hiroshima and Nagasaki, and this is critical for it is here where many current British beliefs on nuclear weaponry originated. The world around the then Prime Minister, Clement Atlee, had transformed: standard modes of warfare and diplomacy were disrupted; international leaders were thrust into an unpredictable and volatile world. The new nuclear weaponry struck to the core of the British psyche (along with memories of Nazi bombing raids on mainland Britain) as it shattered centuries of security as an island nation and maritime power. This newfound national vulnerability induced a frenzy of discussions within the upper echelons of British political and military establishment. However, the decision for Britain to pursue a course to create its own nuclear deterrent was not straightforward (formally occurring in 1947). Initially, Atlee had hoped for United Nations control of nuclear weapons but soon recognised the quixotic nature of this after problematic relations with the USSR, and from then on steered towards a realpolitik outlook of British acquisition of weapons. Another formative strand in the making of the decision for Britain to create its own arsenal were poor relations with the USA – Britain had hoped to a pooling of information would occur between scientists of both nations, but this had been non-apparent as a result of the McMahon Act of 1946 (which ceased Anglo-American wartime collaboration of secrets). Relations descended to a nadir, with the British Foreign Secretary Ernest Bevin complaining of the dismissive nature with which he was treated by his American counterpart. By October 1946, Bevin viewed nuclear weapons as a means for to create greater British gravitas and to fulfil national pride, saying, “We’ve got to have this. I don’t mind for myself but I don’t want any other Foreign Secretary of this country to be talked at, or to, by the Secretary of the United States, Mr Byrnes. We’ve got to have thing over here, whatever it costs… We’ve got to have a bloody Union Jack flying on top of it”. The theme of dwindling national prestige (embodied by Bevin) is intertwined heavily with the idea of deterrence in a dangerous and unpredictable world. It is notable that Tony Blair described nuclear weapons as an “insurance policy” against an unforeseen circumstances and David Cameron used strikingly similar lexicon when stating his belief a replacement for Britain’s current Trident nuclear programme was “insurance against nuclear blackmail”. Through good layout of narrative and interpretation by Baylis and Stoddart, readers are see how much of the seeds of 21st century British policymaking nuclear thought were sown in the Atlee era and parallels between British leaders across decades. The financial implications of maintaining a nuclear weapons system and replacing such a system is a common theme throughout the book, in times of national penury the reader learns of a great divide between then Chancellor of the Exchequer and Prime Ministers over spending on nuclear weapons. In both the Callaghan and Thatcher administrations, rifts occurred between the priorities of the Treasury and supporters of greater investment in Britain’s armoury. In fact, in the Callaghan Treasury representatives were absent from a pivotal 1976 discussion of procuring a replacement for the Polaris (the precursor to Trident programme) programme. Attendees conferred over how sites in the USSR should be targeted by Britain’s nuclear missiles, believing that a total of five, not ten Soviet cities would need to be hit by nuclear strikes to make Britain’s replacement nuclear weaponry an effective deterrent (interestingly, in 1958, it was considered a “credible deterrent’ for forty-four Soviet cities to be substantially hit by British nuclear missiles, by 1964 it was twenty cities). Baylis and Stoddart note any Treasury representatives “would have been very likely to have seized on this option of relaxing the criteria for national deterrence” to delay and possibly cancel improvement plans. The question of procurement affordability was one of many internecine bureaucratic battles which are covered well in The British Nuclear Experience and show how ingrained beliefs regarding nuclear weapons trumped arguments for fiscal expediency. Policymakers today could do well to reflect on the precedents set by their predecessors on how they dealt with Britain’s nuclear issue. Although the foe has changed, Baylis and Stoddart’s study is eerily relevant to present day nuclear quandaries and readers will certainly identify to contemporary issues when reading of Prime Ministers’ dilemmas of whether to edge towards Europe or the USA for military interdependence and other contentious predicaments.The British Nuclear Experience is large in scope and breadth, and does an excellent job of capturing the thoughts of all stakeholders political leaders, military leaders, civil servants) with power, throughout Britain’s nuclear age. The book brings the literature in the field up to date and builds upon works by the likes of Michael Quinlan and Andrew Pierre. Perhaps the only major improvement could be in accounting for those without direct decision-making power. Opinion polls and popular opposition (such as the Campaign for Nuclear Disarmament) are cited but there is minimal page space given to decision-makers’ interactions with those opposed to nuclear armament. With this in mind, it can sometimes feel that the book is not so much an exploration of the identity as a whole of Britain in nuclear weapons affairs but simply that of an elite few. However, this is compensated by the thorough, yet accessible examination of the thought processes of the decision-making core of politicians, civil servants and military leaders. Michael Warren completed an MSc in Empires, Colonialism and Globalisation at the LSE in 2012, having graduated from the University of Sheffield (studying on exchange at the University of Waterloo, Ontario) with a BA in Modern History in 2011. He has researched as part of an open data project for Deloitte and the Open Data Institute, and worked for the All-Party Parliamentary Health Group. He is an Analyst at Accenture. Read more reviews on the LSE Review of Books by Michael. US, Russian war games rekindle Cold War tensions.